Following a failure of the bevel drive bearings of our BMW K1 sidecar outfit, I determined a solution was necessary to eliminate the doubt that now existed in both of our minds, i.e. my better half, and myself. Past experiences of parts failures with other BMW machinery didn't help our state of mind. Without a solution to alleviate our doubts, we quietly conceded that the outfit might have to be "moved on". Of course, the perceived problem was seen as asking too much of the single sided design. 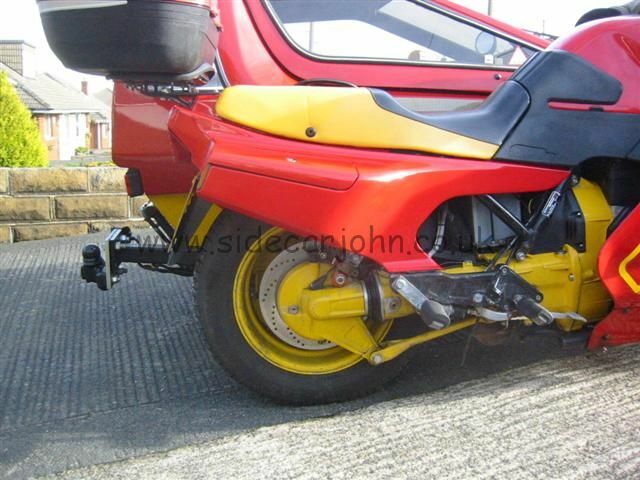 I posed the question on various internet forums, and elsewhere, had anyone converted a BMW K model to a twin sided swingarm ? Responses ranged from incredulous, questioning what was the problem, to guys who understood there could be an issue. A set of bearings, supplied when I bought the outfit, indicated potential problems, but I dismissed this as in every other respect the outfit was attractive. A knowledgeable friend had helped repair the bevel drive, so we were still roadworthy. However, investigation highlighted other BMW paralever bevel drive failures, sometimes more serious breakages than my experience, and not all involving sidecar use. I also identified attempts to address the issue, some amateur one offs, plus a no longer produced twin sided conversion by the EML sidecar company. Some concern prevailed. Would I experience another failure, maybe many miles from assistance ? Advice received suggested treating things as if I had chain drive with frequent physical checks and oil changes. However, my mind set was to change the set up, which led, via a long time sidecar buddy, to his qualified engineer cousin, and a serious motorcycle enthusiast. We set about finding a solution. that several Aussie BMW K model sidecar guys carried spare bevel drives "just in case", whether they've experienced a breakage, or not. Other Beemer owners around the world reported having the necessary spares packed up and ready to be dispatched to them, if things went awry. Such information supported what some might have originally seen as my unique neurosis. I'll keep the first, abortive part of our project to a minimum. Unavoidable side issues slowed the whole process, and sadly the outcome ultimately proved unsuitable. Despite many hours of work, parts acquisition, and a depleted wallet, the first attempt wasn't even considered for fitting. Much modified BMW airhead parts had been the basis, but we became uncertain it would perform as required. Necessary material removal to gain clearance would have compromised strength. Disappointment yes, especially as over a year had passed since starting the project. However, determination prevailed, and Project Mark 2 soon commenced. The steel swingarm and bevel from a BMW R1200C were chosen as the basis of the conversion. A previously obtained car wheel was still suitable for the original concept. The additional support arm now had a bearing incorporated for what would be a live axle. Questions arose regarding brake disc fitting; and shaft drive connection, the latter resolved by a special amendment to the R1200C's shaft to mate with the K gearbox. The BMW R1200C steel swingarm suitably modified for the original K1 suspension unit. Trial assembly of the new setup. Machined alloy hub for 14 inch car wheel, plus additional arm. The longer R1200C swingarm also meant replacing the bike's rear mudguard. Other clearance issues called for minor changes to foot plates, and the K1's plastic bodywork. All minor matters compared with other aspects of the conversion. When the project was originally conceived, using BMW airhead parts, a cycle speedo was fitted believing we would lose the sender capability from the older type bevel drive. Use of the R1200C bevel means the BMW speedo remains active following a lengthening of the sender cable. However, the cycle speedo remains because of its accuracy. Will try to tweak the Beemer's inaccurate readout, plus tidy up the cycle speedo's current fitting arrangement. The Sigma cycle speedo/ computer is triggered by a magnetic sender on the front wheel. A cable model is used because there are questions about electronic interference with wireless types. The cable for the original BMW speedo sender had to be lengthened. Clearance for the additional support arm meant opting for an exhaust change, notably to exit on the right side of the bike rather than the usual left. No exhaust between bike and sidecar (left mounted here in the UK) makes rear wheel removal significantly easier. The original exhaust with previous owner extension. Always a source of intrigue for onlookers with the rather large outlet. Yes, we tow sometimes. Suitable stainless tubing and an exhaust can were sourced locally, whilst salvaged header pipes came from a BMW breaker specialist. A possible financial return on the redundant, one piece K1 exhaust disappeared when it was removed. More cracks and corrosion than enough saw it consigned to the skip. The resulting exhaust is, in my opinion much better in appearance and fitting. Function, of course, can only be determined by use, but I'm confident, especially when considering the bike has managed to run well despite the condition of what was removed. Initial road testing indicates the new exhaust does the job admirably. 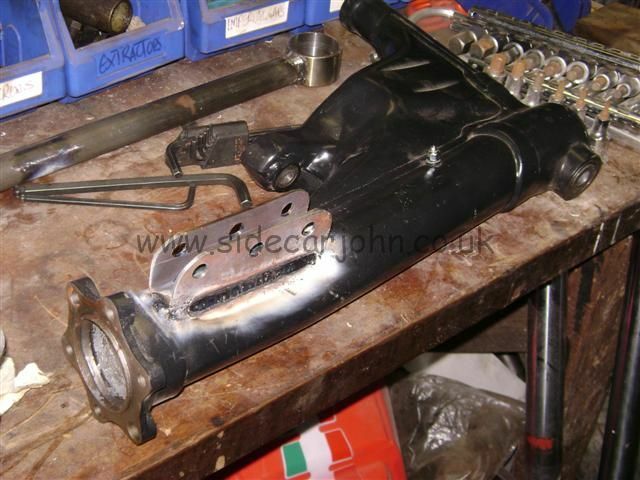 No financial return on this old K1 exhaust ! The exhaust parts come together ready for final fitting and assembly. The initial outcome is pleasing. The only change to riding style results from the gearing, clearly down to an even higher geared R1200C bevel ratio than the relatively high ratio of the K1 bevel. I found that I can be in a lower gear in urban situations than before, and tachometer readings show the engine to be turning over slower. This was not an issue for some of the early miles, but it became clear that a lower profile tyre is preferable, and is about to be fitted. A little maths kicked in before settling on a suitable tyre size. Certainly, a more economic option than using the BMW R850C bevel, which has an identical ratio to the original K1. Wheel removal involves unfastening the central live spindle, lowering the support arm, then removing the four wheel nuts. Easy. The new exhaust location means much easier access to the rear wheel than previously, so that's a bonus. We initially tested the set up in a variety of ways. With SidecarPat in the sidecar the only issue was the previously mentioned gearing, resolved by a change of rear tyre size. Should have done my calculations a little better. The gearing issue wasn't so much how the outfit has performed, just how things would be when loaded with camping equipment, towing, and negotiating serious hills. For sure, the bike runs far better with an intact exhaust system, even if it isn't factory. However, with the good lady on pillion, the rear suspension did not function so well. Nothing to do with our weights, I can assure you, but a mixture of factors, particularly a rather tired monoshock unit, meant acquiring a new one with a heavier load spring. The slightly longer R1200C swing arm had introduced leverage factors, which we realised could require attention, but it had to be assessed on the road. Soon after our few local road tests it was load up and head for Belgium and Luxembourg for two sidecar related events. The radical changes performed well, with only the rear suspension requiring a preload adjustment as it was too soft, notably on poorly maintained, i.e. pot holed roads. Some months down the line we have now used the outfit in a variety of situations. Question marks about the sidecar wheel lead have been generally dispelled since rides in the hilly, switchback back roads of the North Yorkshire Moors. The outfit handled well and did everything we asked of it.